Bjorn Hansen, defending champion and four-time winner of Stena Match Cup Sweden, has set the pace on day one of Qualifying at the third World Championship Event of the 2015 World Match Racing Tour. Hansen and his Nautiska Racing posted five wins and one loss to finish on top of the leaderboard. Eric Monnin Team SailBox from Switzerland and former World Champion Taylor Canfield both posted 4-2, with defending World Champion Ian Williams (GBR) winning his first three matches. “There is an old expression that says that if you win Qualifying you don’t win the event. Things have gone our way today and that’s not how we usually start this event. But we are really excited about our results today,” commented Bjorn Hansen of Nautiska Racing. Up and coming Swedish match racer, Nicklas Dackhammar and his Essiq Racing also sailed impressively on his first day posting 3-1, with wins against Tour Card skipper Kiwis Reuben Corbett and Phil Robertson skippering Team TREFOR. 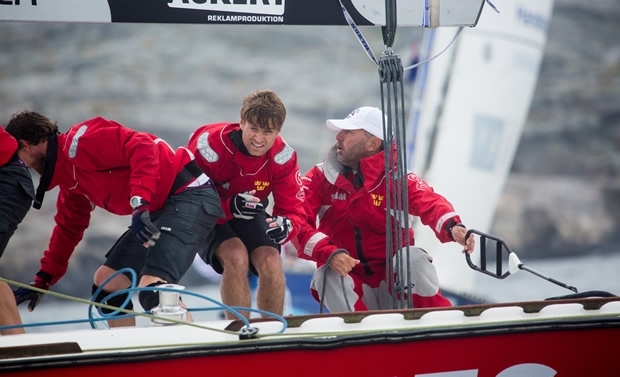 25-year-old Dackhammar, a former Youth Gold medallist in the 470 class, is sailing in his first Stena Match Cup after securing one of two Wild Cards to the event. To gain some local experience, he has cleverly enlisted 2008 Stena Match Cup Sweden winner Mattias Rahm as tactician. Current ISAF Women’s Match Racing World Champion Anna Ostling Team Anna from Sweden is also competing in this week’s Stena Match Cup with the only all-female team. Despite some close races between Bjorn Hansen and Nicklas Dackhammer, Ostling was defeated in her first five races but is revelling in the opportunity to sail against the world-class teams this week. Stena Match Cup Sweden is set to deliver a fantastic week of racing, and whether for sailors and spectators, with clear skies and warmer weather forecast for the remainder of the week and with eight of the twenty three flights of Qualifying completed today it’s been a great start. Racing starts tomorrow at 0930 CET.